[157 Pages Report] Prepreg Market size was worth USD 4.87 Billion, in 2015, and is projected to reach USD 8.64 Billion by 2021, registering a CAGR of 10.12%. Prepreg is becoming crucial in wind energy and aerospace & defense applications due stringent environmental norms, growth in number of wind capacity installations and number of plane deliveries. Various secondary sources such as company websites, encyclopedias, directories, and databases have been used to understand and gain insights for prepreg market. Experts from top prepreg companies have been interviewed to verify and collect critical information and to assess the as to what will be the trend of the prepreg market during the forecast period. The top-down, bottom-up, and data triangulation approach has been implemented to calculate the exact values of the overall parent and individual market sizes. The market of prepreg has a diversified ecosystem including the downstream stakeholders such as manufacturers, vendors, end users, and government organizations. Some of the major raw material suppliers are Royal Ten Cate N.V. (Netherland), Toray Industries, Ltd. (Japan), Teijin Ltd. (Japan), Hexcel Corporation (U.S.), and SGL group (Germany). This research report categorizes the market of prepreg based on type of fiber reinforcement, resin type, manufacturing process, application, and region. It forecasts revenue growth and analysis of trends in each of the submarkets till 2021. 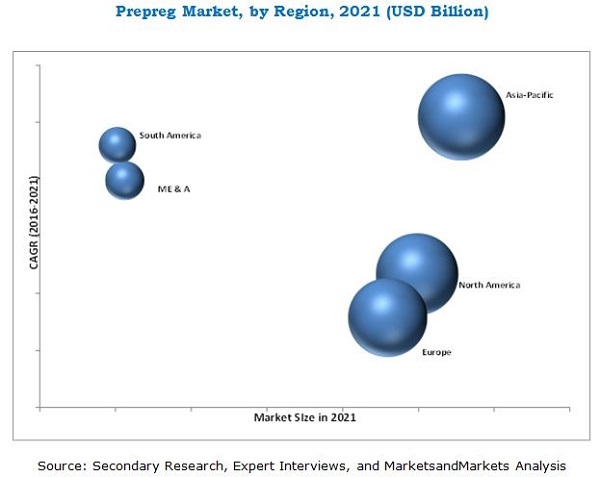 The market size of prepreg is projected to reach USD 8.64 Billion by 2021, growing at a CAGR of 10.12%, between 2016 and 2021. The increasing demand for lightweight and high performance materials in the wind energy, aerospace & defense, automotive, and sporting goods applications are the key factors driving the growth of the prepreg market. The global prepreg market is segmented into fiber reinforcement type, resin type, manufacturing process, applications, and region. The prepreg market, fiber reinforcement type is further segmented into glass fiber, carbon fiber, and aramid fiber prepregs. Carbon fiber prepreg had the largest market size in terms of value owing to growing demand from applications such as wind turbine blades, primary & secondary structures in aerospace and automotive applications, bicycle frames, tennis rackets, golf shafts, and others. The prepreg market, by resin type is segmented into thermoset and thermoplastic. The demand for thermoplastic prepreg is expected to grow during the forecast period due to less curing time and ease of molding into various shapes. The thermoset prepreg account for larger prepreg market share owing to its high demand from aero-engine components and wind turbine blades. The major applications included in the prepreg market include aerospace & defense, wind energy, sporting goods, automotive, electronics, and others. Aerospace & defense constituted a major portion in the prepreg market, by value. The high growth of aerospace & defense application is attributed to extensive use of prepreg in aero-engine and interior components. They have high demand because of their lightweight, durability, and anti-corrosive properties, resulting in reduced maintenance and replacement costs. Asia-Pacific is expected to be the fastest-growing market for prepreg between 2016 and 2021. The growth in the wind energy industry, large investment by government in aerospace & defense, and new product developments by various leading players are a few factors leading to the growth of the market of prepreg in this region. China leads the market of prepreg in Asia-Pacific. Its consumption of prepreg has grown remarkably due to growth in the wind energy, sporting goods, and aerospace & defense industries. The prepreg market size is rapidly growing, in terms of value. However, a few factors act as a tailback in its growth such as issues related to its recyclability and high cost of manufacturing. The companies such as Royal Ten Cate N.V. (Netherland), Toray Industries, Ltd. (Japan), Teijin Ltd. (Japan), Hexcel Corporation (U.S.), SGL group (Germany), Gurit Holding AG. (Switzerland), Solvay SA Group (Belgium) are the key market players in the prepreg market. They are adopting various organic and inorganic growth strategies such as agreements & partnerships, new product developments, and expansions to enhance their share in the prepreg market. 14.9 Mitsubishi Rayon Co. Ltd.